CUTE 4 BEDROOM 1.5 BATHROOM RANCH STYLE HOME LOCATED IN HAMPTON. FRESH PAINT THROUGHOUT. NEW ROOF INSTALLED ON PROPERTY. ELECTRICAL PANEL UPGRADED. NEW LIGHT FIXTURES AND CEILING FANS. CONVENIENTLY LOCATED NEAR INTERSTATES AND SHOPPING. Ready to visit 702 NOTTINGHAM? Request a free property tour! Send me more information about the listing at 702 NOTTINGHAM, Hampton, VA 23669, MLS# 10240082. 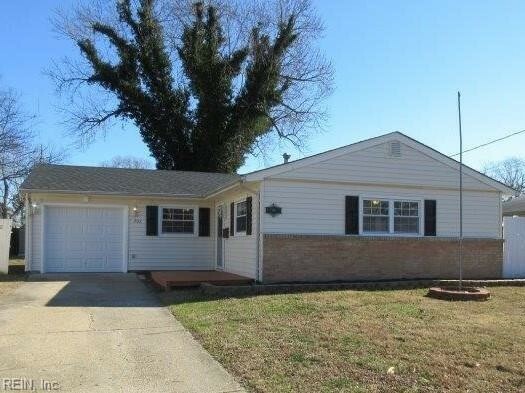 This 4 bedroom, 2 bathroom home located at 702 NOTTINGHAM, Hampton, VA 23669 has approximately 1,135 square feet. It is currently listed for $168,900 and has a price per sqft of $14,881. This home is currently Under Contract under the MLS#: 10240082. This listing is provided by BHHS Towne Realty. 702 NOTTINGHAM Drive, Hampton was built in 1963. It has Garage Att 1 Car, Driveway Spc parking.The kitchen includes Dishwasher, Range, Refrigerator. 702 NOTTINGHAM is part of the Fairfield - 026 neighborhood located in 23669.